Multiple RF-13 valves are used to replace multiple regulators based on design air flow rates – up to (4) RF-13 valves may be connected to one pneumatic controller. Blank-off plates provided for unused holes in the partition plate. Controller(s) are mounted in steel control enclosure for field attachment to the existing air terminal. Controllers are factory tested and calibrated. 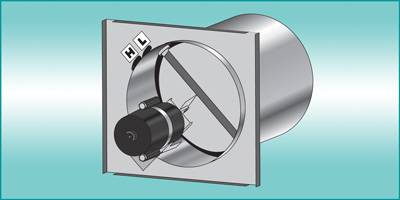 Normally closed, direct coupled actuator when used with pneumatic control systems. Rigid, 22 gauge galvanized steel construction.